The best Technics SL-1200 turntable ever made? | What Hi-Fi? The best Technics SL-1200 turntable ever made? 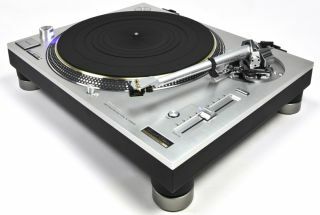 The new Technics SL-1200 turntables have caused quite the stir since they were unveiled at the start of the year. From the initial high price tag (now confirmed as £2799 in the UK) to the special edition model selling out in Japan in just 30 minutes, it's clear our collective appetite for Technics '1200 decks hasn't abated over the years. Which is no doubt where this modified and upgraded model from Timestep comes into play. Not content with what Technics has to offer, this modification, called the Timestep EVOke, aims to further improve the sound quality on the Technics SL-1200GAE. There are two new Technics decks for 2016, the standard SL-1200G and the limited edition SL-1200GAE - and it's the limited edition model with which Timestep, a company based in Devon, England, is concerned. The EVOke version instead features a tonearm from SME Audio, an English company that has been making specialist tonearms for more than 50 years. Cawley claims the SME IV tonearm used here "is a match made in heaven” for the Technics deck. Alongside the new tonearm come another modification, the Audio Technica AT-33PTG/II MC cartridge. Elsewhere the modified EVOke deck also features an external power supply designed by Timestep. Upgrading the power supply is fairly standard upgrade path for higher-end hi-fi components, and the addition of an external power supply here claims to remove a 'haze' from the Technics' audio performance. The Timestep EVOke is available now. It costs £5,764 for the full package or you can buy the upgraded components separately. Find out more on the Timestep website.